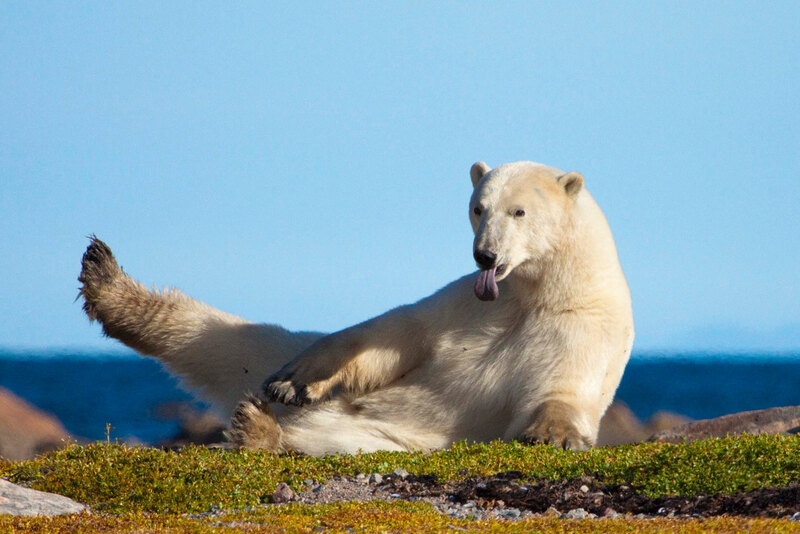 Polar bear in Canada's arctic wilds. Deep in the northern Canadian tundra, Fiona Harper pulls on her hiking boots to track sleepwalking polar bears. It takes four exhausting days, across six tiresome flights on ever-smaller aircraft, culminating in a six-seater de Havilland Beaver floatplane, before I stand within metres of a splendid polar bear. It’s worth every weary, jet-lagged minute. I’m within a whisper of Canada’s Arctic Circle, closer still to the bear, listening to her breathe, gazing into her ­unblinking eyes. The only thing preventing me from being lunch is the wire fence delineating the “backyard” of the Seal River Lodge behind me. I’m tempted to walk closer, maybe press my nose against the fence, but I recall enough of lead guide Terry Elliot’s safety briefing to resist. With half-tonne males capable of charging at 50km/h, that seems a good plan. I make a mental note to forgo my usual morning jog. Even standing a few careful metres back from the four-metre-high electric fence, I can still see the polar bear’s nostrils quiver and ­teeny ears twitch before she stretches out ­contentedly on her belly, hind legs splayed, ­eyelids folding over inky-black eyes. I feel like doing the same, but there are great sloths of Nanuk – as the Inuit call polar bears – roaming the tundra and I’m keen to pull on my hiking boots and get amongst them. Lobbing into Seal River Lodge mid-autumn on a Churchill Wild Arctic Safari, I’m here to get up close and personal with the world’s ­largest land carnivore. Despite their fearsome reputation, we’ll be tracking them just as Inuit have done for centuries: on foot. At this time of year, bears are virtually sleepwalking – roving around in a form of ambling hibernation. In mid-summer, once the ice melts, they lose ­access to seal hunting grounds, forcing them ashore. Walking the same path, following their paw prints at ground level, seems to conflict with everything I’ve read about Ursus maritimus. It’s a solemn message that I’m reminded of constantly throughout the next week. “Right then, put your boots on and let’s go find us some bears,” laughs Terry wickedly, slinging a rifle over his shoulder. And so, with some apprehension, our small group of wildlife enthusiasts leaves behind the safety of the lodge to “go find bears”. Walking single file across spongy tundra blossoming with miniature scarlet blooms, we’ve barely time to find our stride before we get the hand signal from Terry to stop. A bear is basking in the longish grass on the foreshore ahead. No doubt she heard and smelt us long before we saw her, despite the tracking skills of our two heavily armed guides. The bear watches us. We watch the bear. Soon, she rises, advancing in a cautious sideways pattern. Bears will approach prey in this zigzag manner rather than making a direct approach. “That’s far enough,” Terry commands harshly once the bear is about 40m from our huddled group. Blood rushes to my head as she continues her lumbering advance. A couple of tidal pools dotted with suitcase-sized boulders are all that stand between us. She pauses ­momentarily, nostrils twitching, our camera shutters hammering rapidly, hearts even faster. With her head bobbing down between massive shoulders, she quite deliberately lifts a paw the size of a dinner plate and resumes her approach. At around the 30m mark, Terry lobs a small rock in front of her. It’s all that’s required to discourage her as she wheels around and retreats a few paces. Known affectionately as Blue Moon – due to her blue-stained rear from sitting in a berry patch – she throws one more petulant glance at us over her shoulder before sauntering away. “Go on, off you go,” Terry calls to her retreating backside, just to reinforce who’s the boss. Elated at this first of many close encounters, we grin foolishly at each other. Watching ­Nanuk amble away, my heartbeat gradually ­returns to normal. Over twice-daily hikes we see so many bears that eventually they become just one component of this fascinating land. Through the dining room windows we watch them lumbering across the landscape, swimming in the sea, sunning themselves on the beach. As we’re sipping wine beside the fire, an inquisitive young bear ventures close to the lodge, standing up on all fours to peer inside. Though we also spot caribou, sic-sic squirrels, arctic hare, fox and great flocks of birds, the bears steal the show. We return to the tiny town of Churchill, ­reluctantly, where an itinerant white bear ­contrasts against reddish foliage. I recall an Inuit legend about this great Arctic traveller, who will ride an ice floe until the bitter end when he is forced to swim. Pihoqahiak, they called him – “the ever-wandering one”. ­Energised from a safari expedition into a land few humans ever see, let alone inhabit, it ­occurs to me that polar bears might just be on to something. Could travelling far and wide ­beyond our comfort zone be the answer to that wretched travellers curse, jetlag? 20 European gems beyond the obvious hotspots and more! Hi Fiona – Glad to hear you had such a great experience!